After passing through Sedona and Flagstaff, we arrived at the South Rim. It was too early to check into our hotel, the Yavapai Lodge, so we went to Mather Point for our first "ooh-aah" overlook of the canyon. The Grand Canyon, which at first (second and third, etc.) glance may seem so straightforward is, to borrow the words of Winston Churchill, "a riddle, wrapped in a mystery, inside an enigma." (He wasn't, however, speaking of natural wonder.) 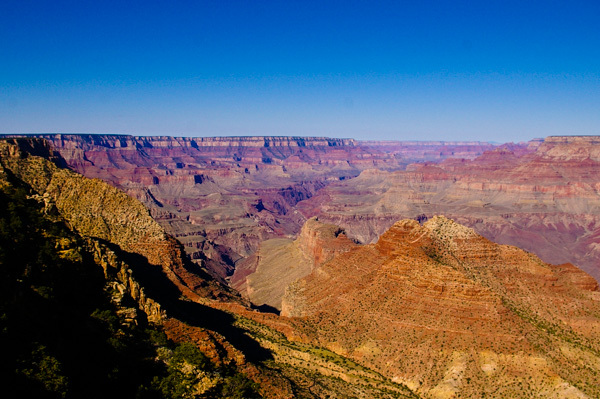 One of the recommended books, Carving the Grand Canyon, surveys all of the leading theories. 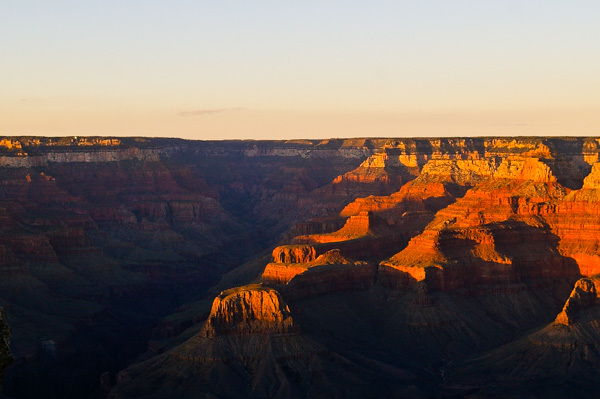 The summary at the end describes the two sentences containing the "most truth" about the canyon's origin: "The Grand Canyon was carved by the Colorado River. To date, geologists have been unable to determine the canyon's precise age and what specific processes were at work in carving it." While presenting the pictures that I took, I will occasionally point out some of the mystery and questions. Mostly, however, I just wondered at the gorgeousity. We were lucky to have a partly cloudy afternoon. The cloud shadows make it easier to take pictures of the canyon because of the contrast. 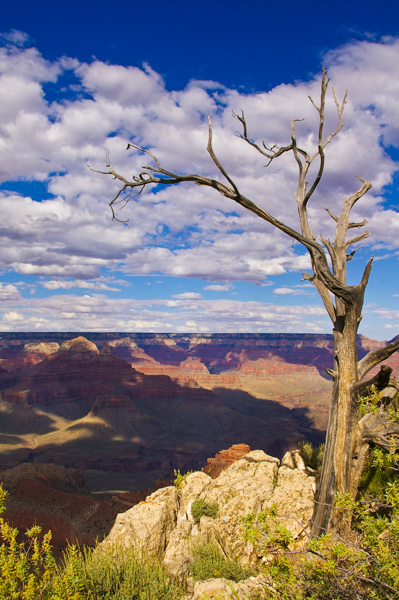 Mather Point is named for Stephen T. Mather, the first director of the National Park Service. We had the opportunity to walk along the rim, which is delightfully free of barriers, fences, etc. in most places. I can't remember which of these formations is which, but one of them is Vishnu Temple. The South Kaibab trail down to the Colorado River runs along the ridge in the foreground. Someday I hope to take a mule into the canyon and spend the night at Phantom Ranch. 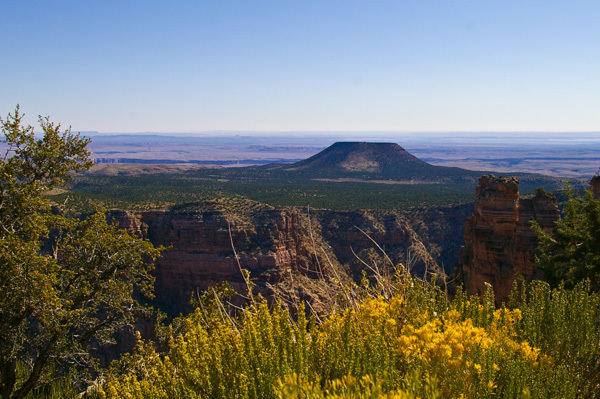 At every vantage point along the rim – north or south – I could just sit and look. As one of our group summed it up: words can't begin to capture this place – nor can pictures for that matter. 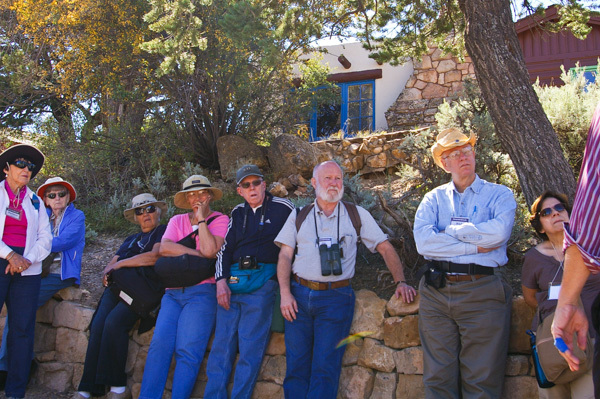 The next morning we visited Grand Canyon Village where local historian Henry Karpinski told us about the places and the people in the history of the canyon. Jim and others are standing in front of one of the Bright Angel Lodge cabins listening to Henry's entertaining, irreverent, and informative talk. 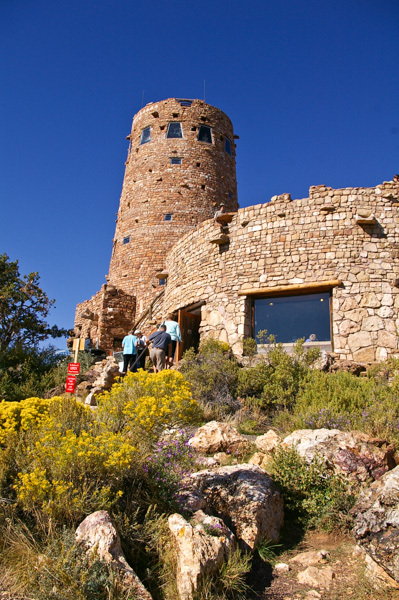 Lookout Studio is among the many structures at Grand Canyon designed by the most famous architect you never heard of: Mary Colter. She achieved great things in a profession and at a time when women were never expected to succeed outside domestic pursuits. We were fascinated by her and eventually bought a biography. When the CCC was building the canyon infrastructure, including this wall, the Harvey Girls were living in a dormitory that faced the wall. In spite of rules against marrying, stories grew around the heart-shaped "Love Rock" that can be seen inset into the wall between me and Jim. Perhaps a heart-sick CCC man carved it and placed it here as a message to his beloved. 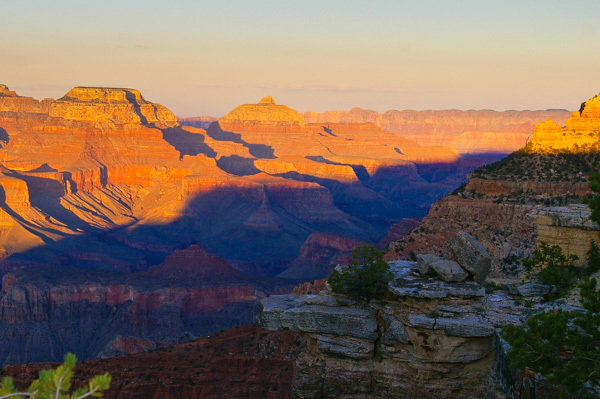 At the end of the 19th century there were already a number of individually owned tourist camps and inns at the Grand Canyon, most of them on or near earlier mining claims. In 1901, the Santa Fe Railroad completed a railway line to the canyon. This station was completed by 1910. 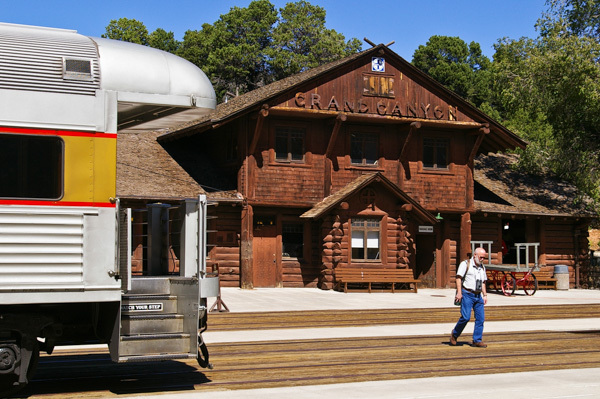 The line is now operated solely for tourists by the Grand Canyon Railway, which runs one round-trip train daily. 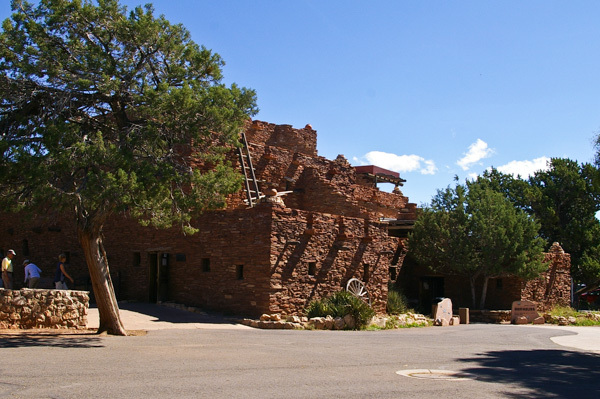 The railroad completed the El Tovar in 1905 as one of the first great hotels in the southwest. It was operated by the Fred Harvey Company. The existing tourist camps couldn't compete with the El Tovar in luxury and eventually the railroad squeezed out the small operators. The Park Service's selection of Fred Harvey as the sole concessionaire dealt the coup de grace. Jim & I had a very nice lunch at the hotel restaurant. The railroad had noticed that in Albuquerque and other places enterprising locals carried on a thriving business selling souvenirs to tourists. 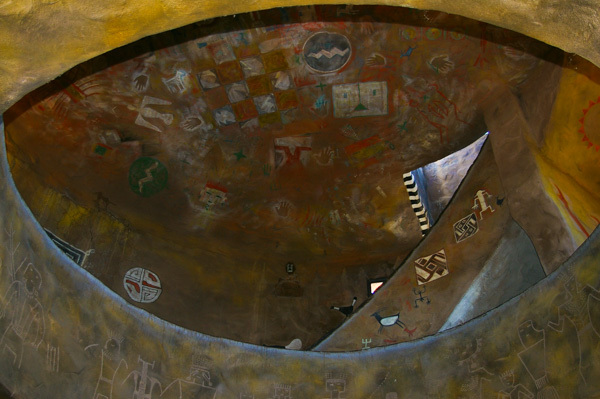 Not to be outdone, they commissioned Hopi House, also completed in 1905 and designed by Mary Colter, to be a workshop and gift shop selling Native American crafts. It is across the circle from the entrance to the El Tovar. 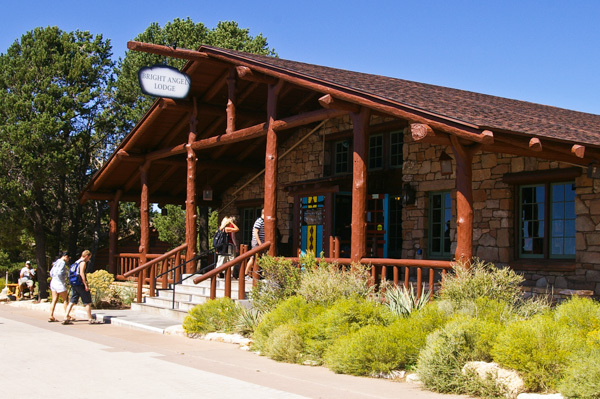 Mary Colter also designed the Bright Angel Lodge in 1935. 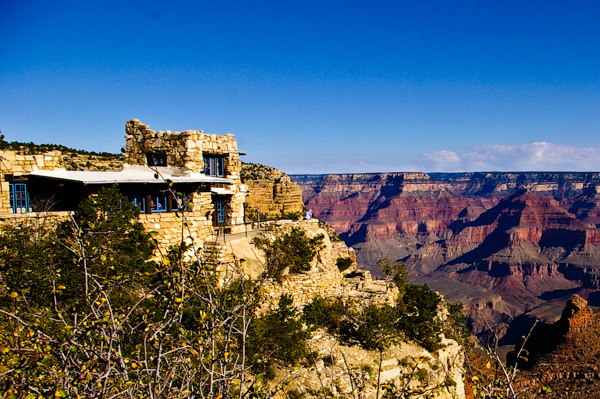 It consists of the main building, shown here, and a number of small cabins, many of which directly overlook the rim. One of the cabins was the backdrop for the group picture above. While visiting my cousin in Kansas we had discussed the epic migration of the Monarchs. 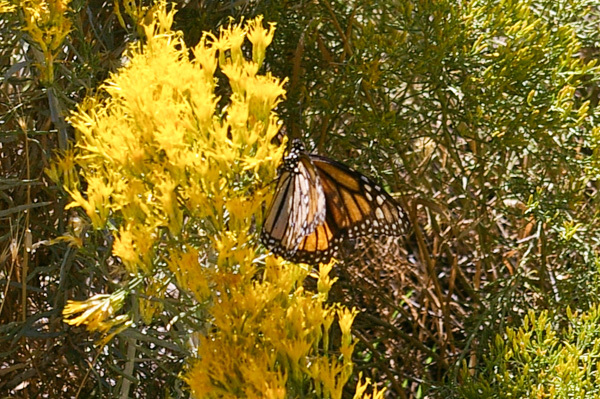 I had not seen a monarch in Virginia in quite some time, so I was pleased to see this one just opposite the Bright Angel Lodge on its way to Mexico for the winter. 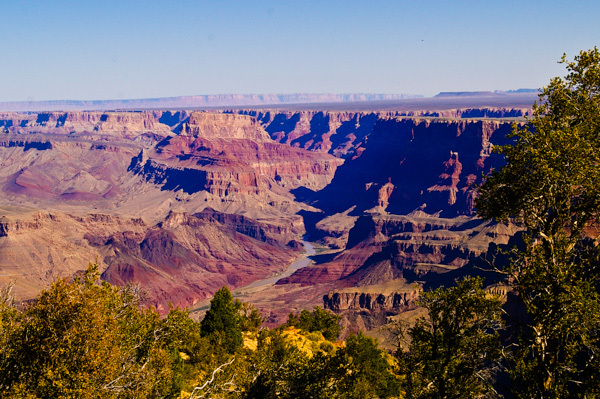 In our litigious society we were amazed that, throughout most of the Grand Canyon, it was possible to walk right up to the rim (or over it if you weren't careful). In fact one night there was a ranger talk on "Death in Grand Canyon." The largest number of fatalities was from a mid-air collision of two commercial airliners that in part led to the creation of the FAA. The intent of the talk was not ghoulish – it was to warn people of the dangers and how to be safe. 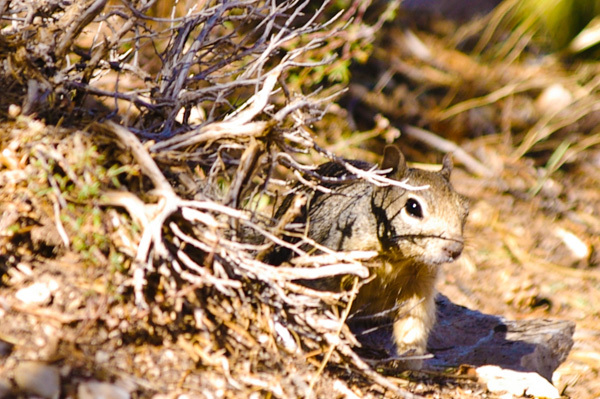 We saw several rock squirrels on the south rim. And no, I didn't lure him into range for this picture - the zoom lens is my friend. There aren't many places along the rim where a significant reach of the Colorado River can be seen – this is about the largest. Although it may look like a tiny stream here, the river is about 300 feet wide. That's the length of a football field. Scale matters. After passing through the Glen Canyon Dam the river is clear and green. By this time it has picked up quite a load of sediment. 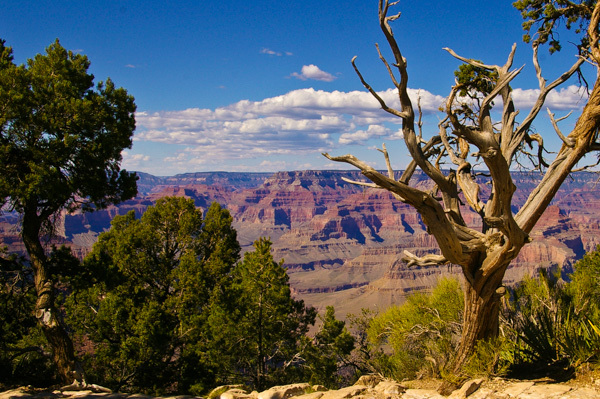 There is a free shuttle that runs about eight miles along Hermit's Road from Grand Canyon Village to its terminus at Hermit's Rest. 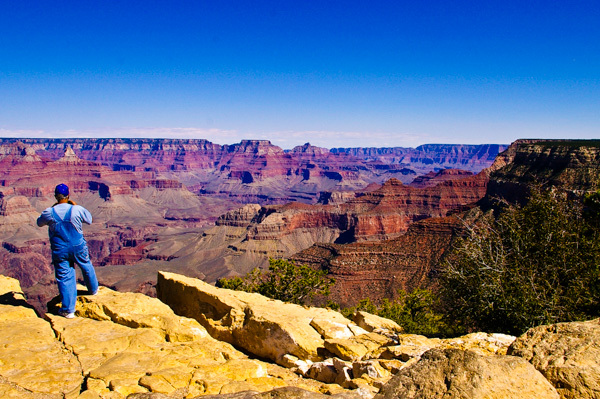 There are several stops along the way and it is possible to walk on the rim the entire distance. I took A LOT of pictures and it's been hard to limit the selection. The Hermit's Rest overlook is at the end of the south rim drive. There is a gift shop and snack bar designed by none other than Mary Colter, but the building is smack on the rim and trees and shrubs have grown up enough that I couldn't get a picture of it. There is more info about this building at the link. Based on what I've found online, this is a western scrub jay. My bird identification skills are pretty rudimentary, so I could be wrong. 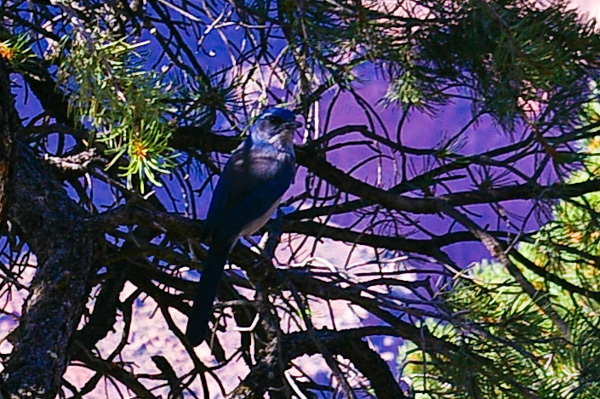 There are a number of different jays found at the canyon. 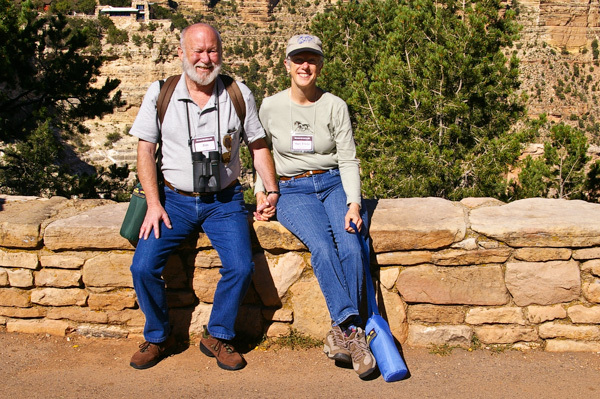 We were hoping to see a California Condor since they are released near here, but we never did. That afternoon we were back at Mather Point to watch the sunset. Because we were here in the fall it wasn't particularly crowded – although we were by no means the only folks there. At least it was possible to get a good vantage point and settle in to watch the changing colors and shadows. I have pretty much the same picture above taken at a different time of day and with cloud shadows. It's fun to see how the lighting changes the view. 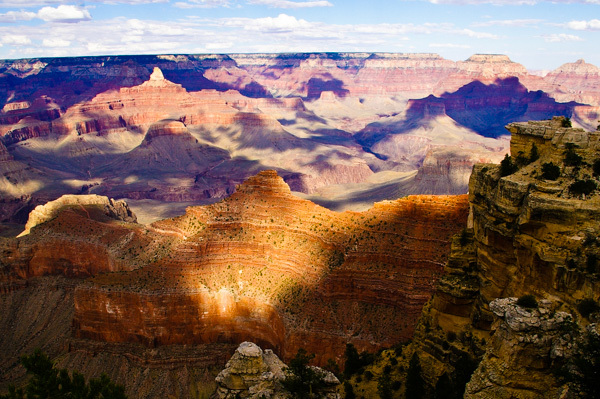 People who only visit the canyon in the daytime miss the dramatic effects of the changing shadows. I haven't included any of my mid-day pictures because they are all washed out and bland. 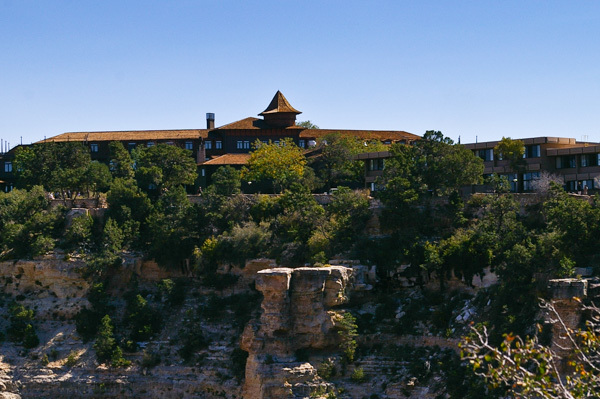 Believe it or not, this is a picture of the North Rim Lodge. Where is it, you ask? There is a tiny speck of light reflecting from the large lodge windows. It is on the rim to the left of the picture. Tomorrow we will be there. The side canyon in the center of the picture – all in shadow here – is Bright Angel canyon. At this point the canyon is roughly ten miles wide rim to rim. The next morning we were back on the bus for our trip to the North Rim. 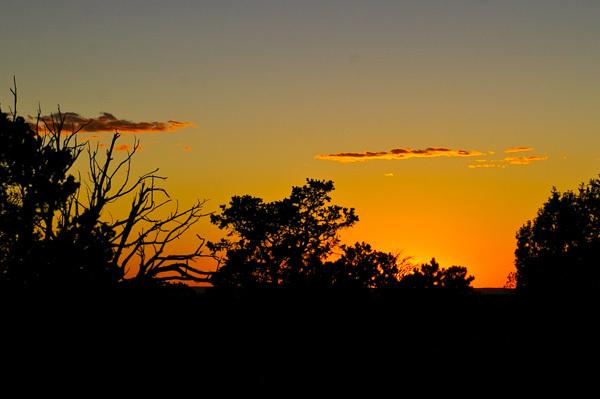 Another of Mary Colter's creations is this tower called the Desert View Watchtower. Her attention to detail is evident throughout the construction (I can't post the many pictures I took, alas). 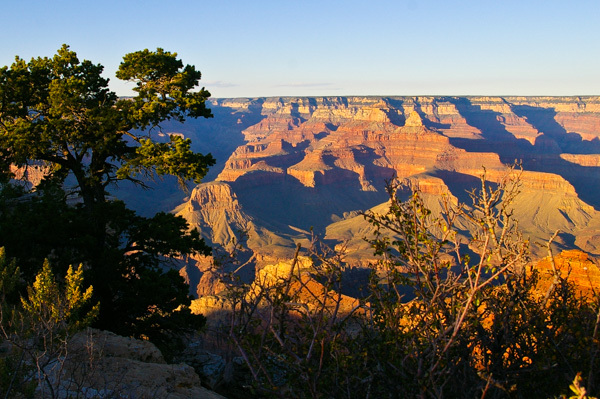 In his talk Henry Karpinski described the care with which she researched the canyon and chose this particular location. He also said that part-way during the construction Ms Colter was called away for a few weeks. While she was gone the workman continued construction thinking that they understood her general plan. But "general plan" wasn't enough. She made them tear out all that they had done and rebuild it under her guidance, which extended to the placement of specific rocks. The building was a work of art. This picture gives only an indication of the elaborately planned decoration of the interior. Curving staircases gracefully ascend to the three levels. This picture is taken looking to the west down the canyon. 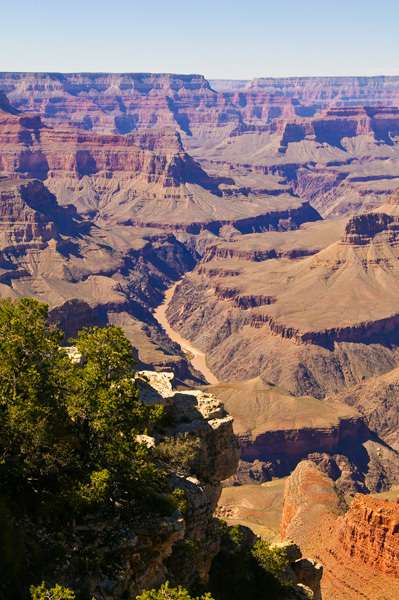 It illustrates that the slope from the north rim, on the right, is much more gradual to the river, which can't be seen at the bottom of the gorge. 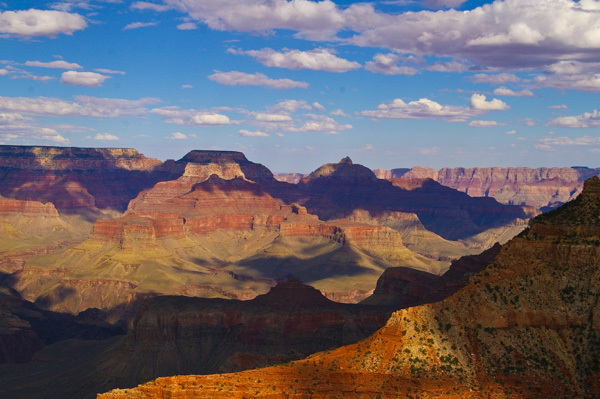 It is also possible to see that the north rim is higher than the south rim – by about 1000 feet. The view east over the Painted Desert. We saw more of this region on our way to the North Rim. This picture indicates one of the many anomalies of the Grand Canyon. Normally rivers flow around higher landscape features, but here the river has carved a deep gorge through an uplifted area that is much higher than its surroundings. Why? How? When? Theories abound, but no one knows for sure. Looking north, the river, which can be seen here for a change, makes a sharp turn. It has been flowing south, but it makes an almost 90-degree turn to the west here. Why it does so is another of the many puzzles about the river and canyon. Beyond the canyon you can see how flat the terrain is for many miles until the Vermillion Cliffs in the distance. In the afternoon we will drive along those cliffs. Continue with us as we drive from rim to rim. Although the canyon is roughly 10 miles wide as the condor flies, we will drive over 200 miles to get to our destination. It will take most of a day.